Whether it's made from potatoes, corn or rye, vodka's calorie content depends on the alcohol level rather than the main ingredient. All vodkas are created in much the same way, by fermenting a starch and then distilling the result. The alcohol is purified during the distilling process, while the fermented potato or grain stays behind. All distilled beverages of 80 proof -- or 40-percent alcohol -- contain about 64 calories per ounce, or 97 calories in a typical 1.5-ounce shot. 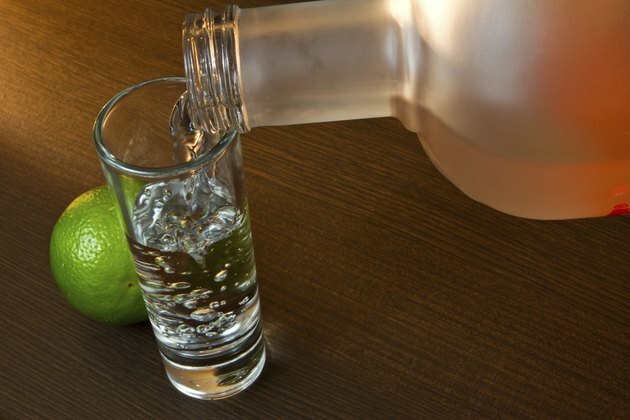 The more alcohol your vodka contains, the more calories it will have. For example, 100-proof vodka contains about 82 calories per ounce, or 124 calories per shot. Mixers like orange juice or nondiet soda will add more calories. CBS Minnesota: Good Question: How Is Vodka Made?